It is so hard to know if you are really seeing your classroom for what it is – rather than what you want it to be or what bugs you about it. Or as simply a collection of small events that deviated from your predictions of how you thought it would go, or heard it would go, or read it would go. We share stories of our classrooms and those stories are a collection of things that stood out. Little pieces of awareness that we brought into consciousness. But who knows what we missed or how our consciousness mutated the actual events in the room. They are by definition incomplete stories and maybe at the end of the day the best teachers are the ones who can reconstruct the clearest and most accurate picture of their class as a whole. Along the way I’ve realized that every time I felt out of control, or stressed, it could be alleviated by improved lessons, or new structures. No doubt about that. But somewhere below all of those great teaching strategies that we know work – there are still personal insecurities that need to be understood. Teaching will make you confront those. That’s the spiritual part. I thank my profession and my students for exposing me to my own. It made me a better person… who then became a better teacher. This letter really is for me – I probably won’t even spell check it. I’m certainly not going to tweet it. I’m writing it because I feel I have to. Even if only discretely – I want to go on the record somewhere as a challenge to myself. My main goal for second semester is to increase the amount of thinking students do. I want to decrease the amount of time they spend reproducing and practicing any particular procedure. I want more of their procedural fluency to come from interesting questions, engaging tasks, or a conceptual understanding. I need to be more purposeful with my questions. When assigning tasks I want to have two good questions predetermined for each. solution method not immediately clear but solution seems attainable with effort. Homework to be more review oriented. 1 review, 1 conceptual, 1 new. Something like that. Write it out a week in advance. Continue to rely heavily on vertical non-permenaent surfaces and visible random groupings. Give students time alone for quite contemplation before having them begin group tasks. Focus on MP.4 and MP.3. MP.4 Modeling: What does it mean to model with mathematics? Unanswerable Questions type openers. MP.3 Viable Arguments. 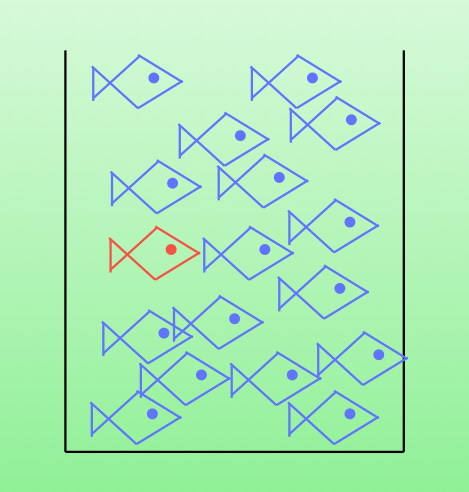 – How often do you get students to compare and contrast approaches? I want to maximize the effectiveness of this both at whiteboards and at their desks. Keep having fun and knowing that it’s impossible to reach every student. Keep learning more and more and more about your students as people. Read the standards you are being asked to teach. Can we represent this differently? I want to say CONVINCE ME a lot. Focus on process versus answer getting. Be more honest with myself when I am giving problems that have only one solution method. Use Michael’s student teaching as an opportunity to study the effectiveness of lessons without having to facilitate the lesson. Managing “flow” and allowing for the existence of “productive struggle”. Allow the last 5 minutes of class for debrief / exit tickets. Finish my presentation on modeling for TMC16. Determine what a conceptual understanding of each topic would look like, and how would we use that to build procedural fluency? This is a popular activity – here is a link to a post from Dan’s blog back in 2008 about the same lesson. I’m writing about it now because I love it and want to remind people of it if they had forgot. Students get to validate the model through experimentation. Has a high ceiling as part B above is a fairly high level evaluation of the model. It doesn’t have an open middle. The only variation in methods comes from how they set up the proportion. Brief overview of Capture / Recapture: It’s a technique used to estimate populations. 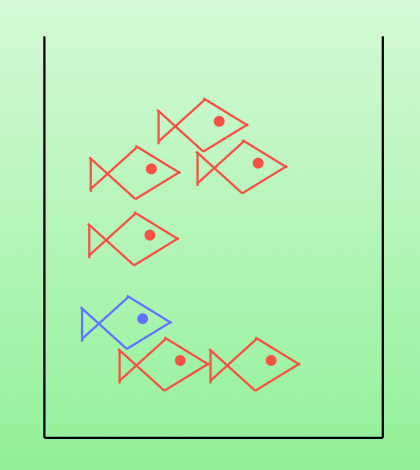 For example, let’s assume we wanted to estimate the population of fish in a lake. We would first capture and tag a set of fish. After releasing them and giving them time to disperse back into the lake we would go back out and capture another set of fish and see how many of these recaptured fish had a tag from the first capture. We would then assume that the ratio of tagged fish in our second capture, to the size of our second capture, is exactly the same as the ratio of fish we tagged in our first capture to the total population of the lake. Is that model valid? Turns out to be surprisingly accurate based on some interesting assumptions that the worksheet at the end will take the students through. 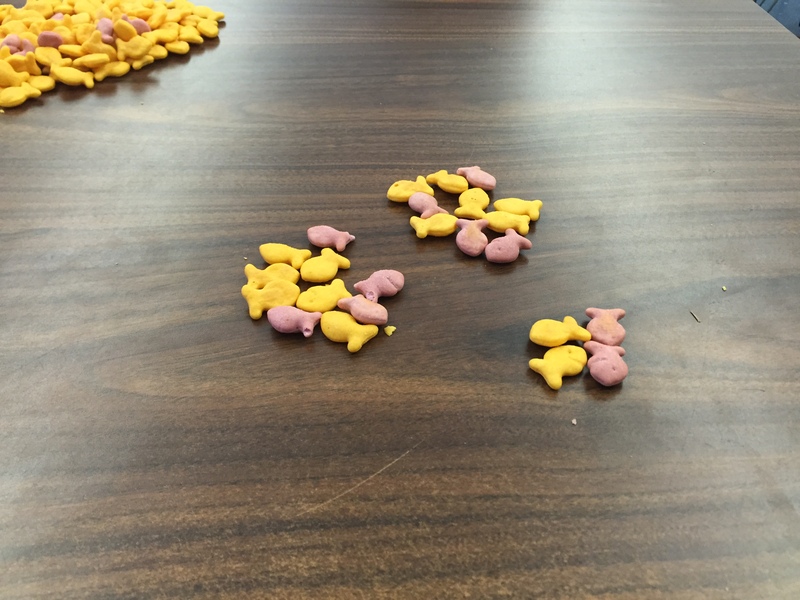 I use regular and pink goldfish to take students through a simulation. 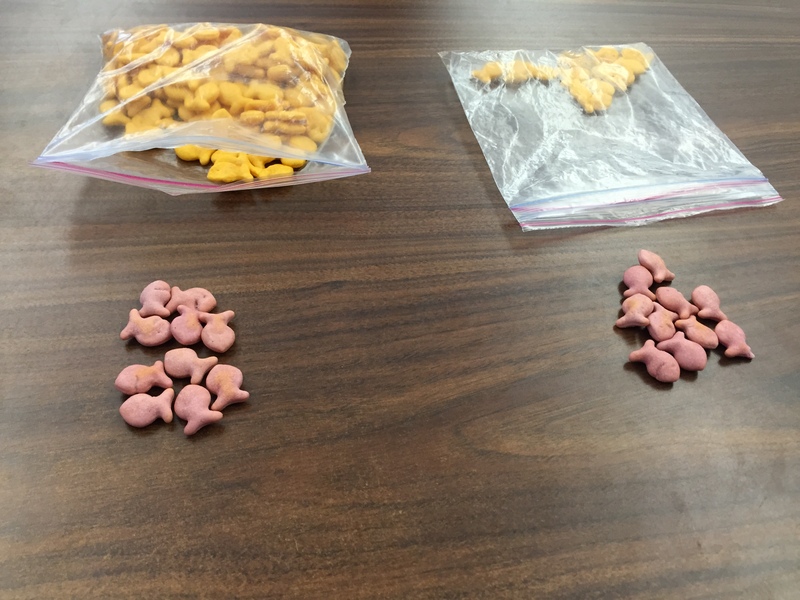 In groups of two, each student gets a lake with a lot of fish in it, a lake with not very many fish in it, and a bag of pink fish. 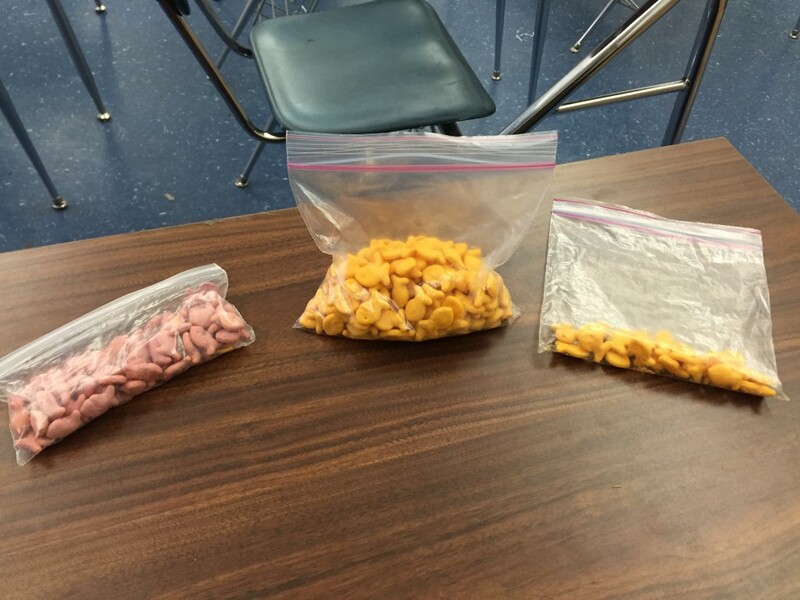 Each fish goes back into the lake (bag) and are given sufficient time to reintegrate into fish society (shake the bag). Then go back out to the lake and again capture 10 fish. 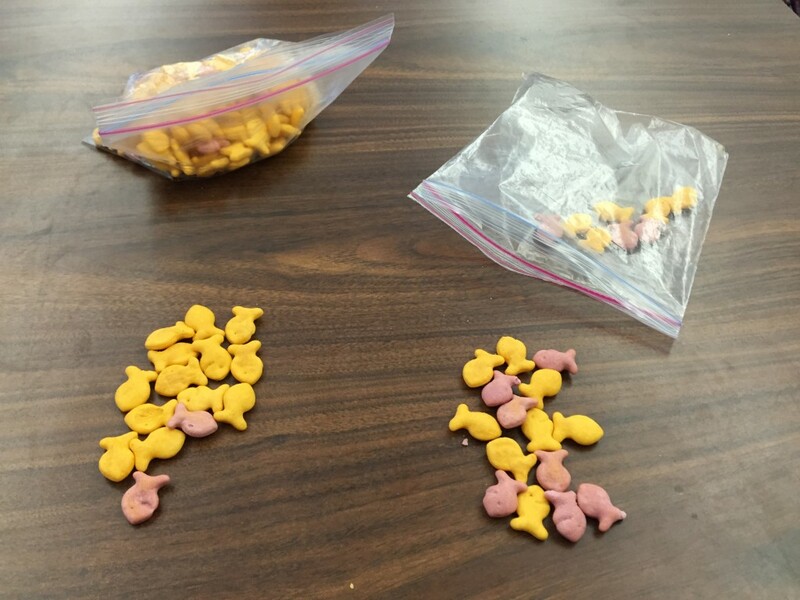 Record how many of the fish in this second capture have a tag from the first capture. Now setup your proportion and solve. 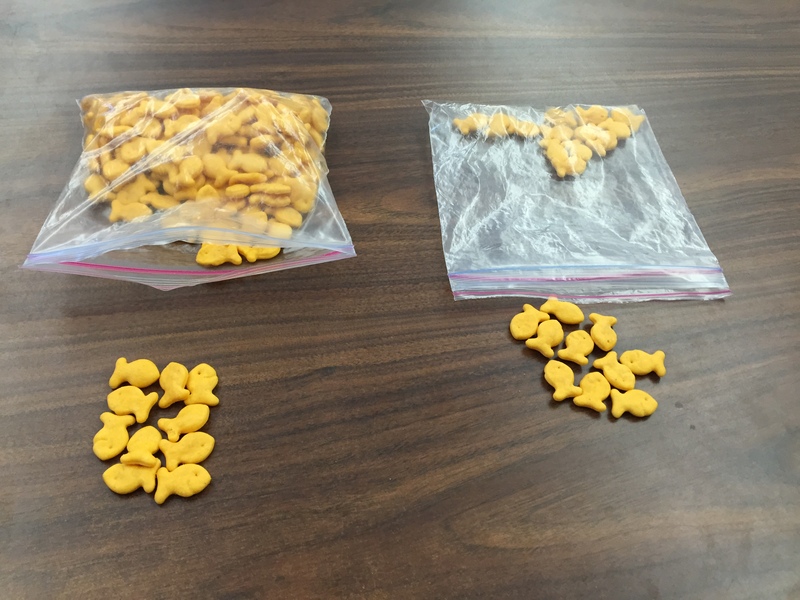 Math says that the proportion of tagged fish to non-tagged fish in the second capture is exactly the same as the proportion of fish captured in the first capture, to the total population. 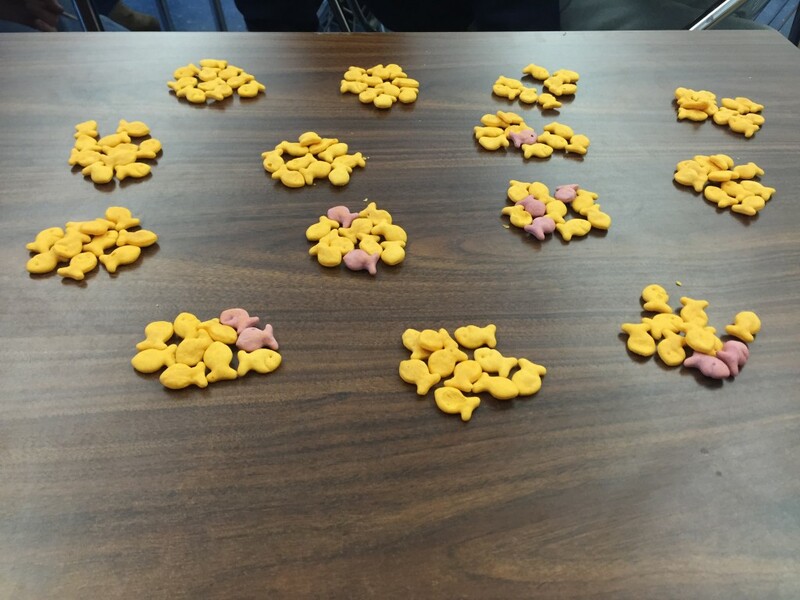 That those little piles of fish up there are a model of the entire fish population. Ok that’s it. Other than that I just recommend doing some research on capture / recapture because there are a lot of interesting research articles and youtube videos on the topic.